A US teenager was beaten while in Israeli police custody in East Jerusalem. 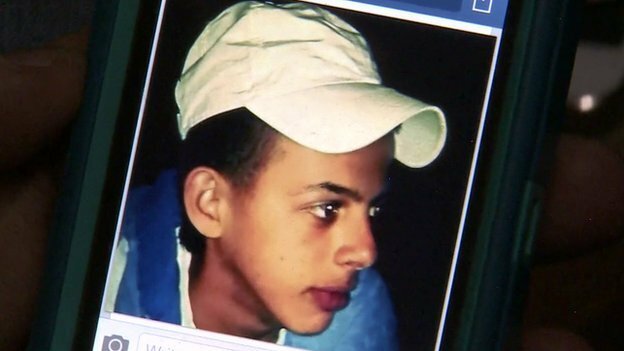 Tariq Khdair, 15, from Florida, is a cousin of Mohammed Abu Khdair, the Palestinian 16-year-old whose abduction and murder has triggered riots. The US State Department says it is “profoundly troubled” by reports. Israeli officials say they are looking into the incident. Police say the youth was among a group attacking officers. However, Tariq Khdair’s family denies that he was involved in the violence. Unrest has spread from East Jerusalem to several Arab-Israeli towns after reports that an initial post-mortem examination found Mohammed Abu Khdair had been burned alive. Mobile phone footage taken during Palestinian protests on Thursday appears to show two Israeli border policemen holding down Tariq Khdair on wasteland in East Jerusalem. The footage shows one of the officers punching the teenager in the head before the boy is taken away. Photographs taken later show him with a severely swollen face. US State Department spokeswoman Jennifer Psaki said Tariq Khdair, who is still in custody, was visited by a consulate official on Saturday. “We are profoundly troubled by reports that he was severely beaten while in police custody and strongly condemn any excessive use of force,” she said. The Israeli Justice Ministry said the police investigations department was looking into the incident. Thousands attended Mohammad Abu Khdair’s funeral on Friday near the family’s home in the Shufat district of East Jerusalem. Mohammad Abu Khdair’s believes he was killed by Jewish extremists in revenge for the murders of three Israeli teenagers – Naftali Frenkel and Gilad Shaar, both aged 16, and 19-year-old Eyal Yifrach.